Now you can have the fun of Neverland without actually producing Peter Pan! Pam is the president of the drama club at her high school, but due to cutbacks, the club may soon be eliminated. Pam and her thespian friends decide to save the club by putting on a huge production of Peter Pan. But Coach Rook has other plans. He’s facing his own budget crisis in his football program and sets his Pirates loose on the drama club to wreak havoc! Football players audition for parts, cheerleaders become mermaids, and in desperation, Pam recruits students from detention to play the Lost Boys, well, Girls. 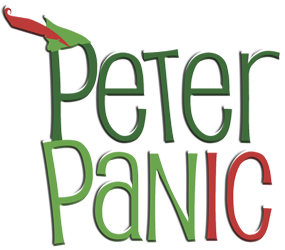 Read more...As if surviving Rook’s sabotage wasn’t bad enough, Peter Pan spirals into Peter Panic when the school suddenly includes hooks on the list of weapons banned at school! Just when all seems lost, star quarterback Tinkerman, who plays — you guessed it! — Tinkerbell, sacrifices everything, including his football career, so the show can go on and Pam can see her dream come true! This refreshingly clever and fun homage to the original classic is full of heart and will remind both the young and the young-at-heart to always follow their dreams! These collections, one for young men and the other for young women, include piano music from both Broadway and movie musicals, notes describing the setting and motivation for each song, and accompaniment recordings available online. How Can You Reach the Stars?